After facing allegations of using official funds for private purposes, Tokyo’s governor has announced the results of a spending review.Two former public prosecutors say they have found a number of inappropriate expenses but say none of them are illegal. 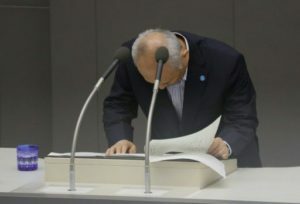 Yoichi Masuzoe started his news conference Monday by bowing in apology for any trouble the situation caused.He has been battered by criticism since the allegations broke in a weekly magazine. 1.Does the allegation against the Tokyo Governor Yoichi Masuzoe affect you? Japan’s literature In 1998, he published a book entitled When I Put a Diaper on My Mother, which detailed his experience caring for his mother and the obstacles imposed by the Japanese welfare system. 3.Masuzoe, while Governor of Tokyo, is reported as having joined in general laughter.“You are the one who must get married as soon as possible” and “Can’t you even bear a child?” he said to Ayaka Shiomura.